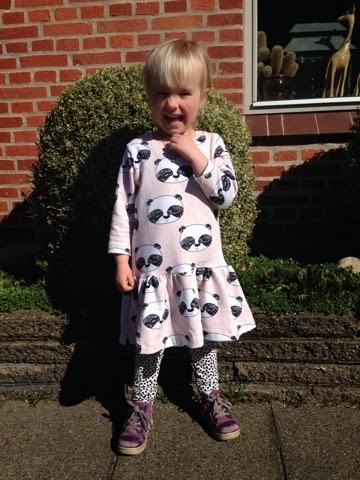 A cute kid and pandas in the same picture - it doesn't get any cuter than that! I'm on a kids sewing binge and I finished this little outfit during my easter break. The pattern is Onion 20045. It gives you a few variations - among these ruffles. I'm planning to use this pattern again, but next time, I'll use a more drapy jersey instead. The pattern is really simple so don't stir away because of the danish language. The sweatshirt knit was a bit expensive but it's a really lovely quality. The pattern is easy - would be perfect for summerdresses too with short sleeves. I haven't photographed the clothes I have made for myself recently. Why is it such a hazard to get decent pictures? - perhaps a new camera will do the trick? If you will like to follow my journey in clothesmaking more closely, you can find me on Instagram - my username is "sewbluedresses". I hope, you stop by and say hi! Have you started planning your summer sewing projects yet? 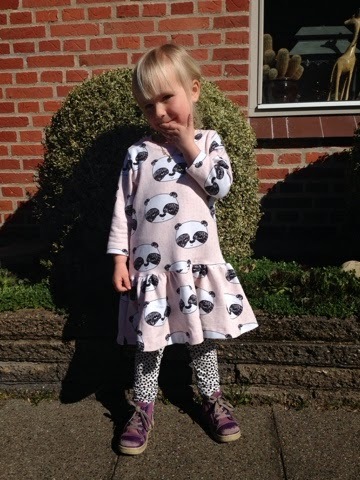 I love that panda print! I used of have a dress with a ruffle like that when I was wee, I loved it! I also find it really hard to get blog photos taken, and also have an unblogged plantain.